WORLDS FIRST FREE GP2x eMAG! This is absolutely great! !, very informative and well laid out. thanks. wow. very very cool! lookin forward to the next issue. Very good magazine! I might write an article or twenty. Nice mag. A few things I noticed, though: 1-Minigame Project wasn't actually rated. Is this intentional? -2- InstallationofMameisquitestraightforward. Now, I understand that you didn't want to go down a line with the whole "straightforward, but a dash at the end of straight would have fixed it. -3- I was under the impression that GP2X Mame had support for a few hundred games, not over a thousand. Could be wrong, though. aaand... I've not read past Mame yet. Have work to go to. Great job on the mag, though! Great screenshots. Maybe for future content you can comb through the various gp2x sites and compile reviews instead of soliciting all new articles from scratch? 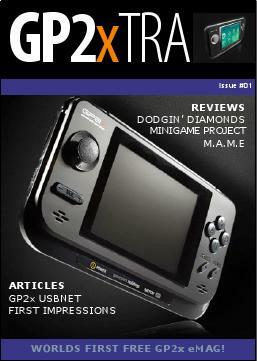 Finally a decent gp2x mag! Magnulus: no MAME on the 2x supports over 1100 games.